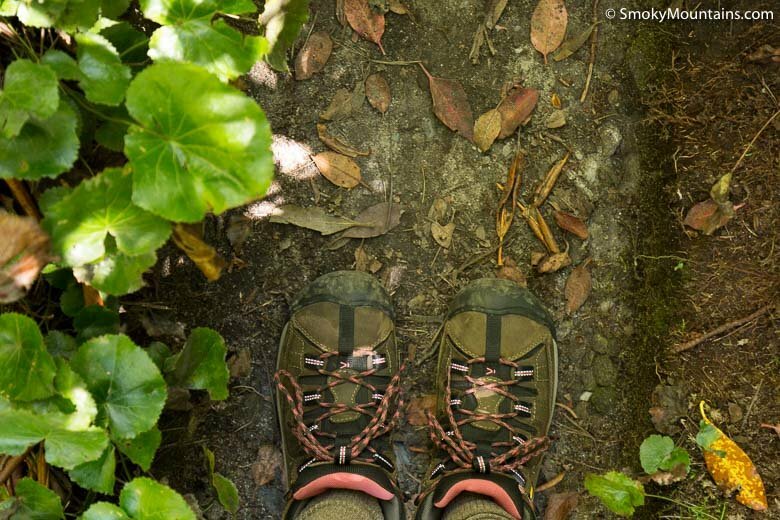 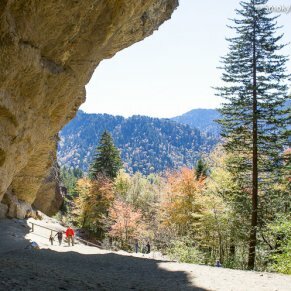 This challenging 6.8 mile roundtrip hike is a worthy endeavor and the visual rewards are great! 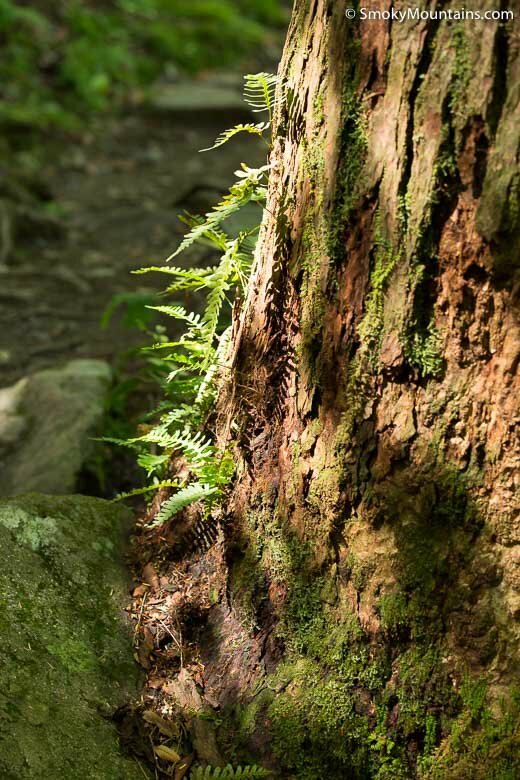 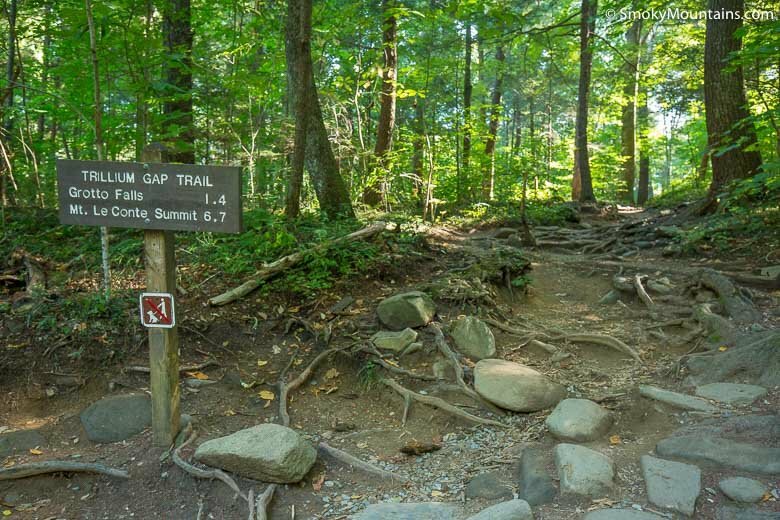 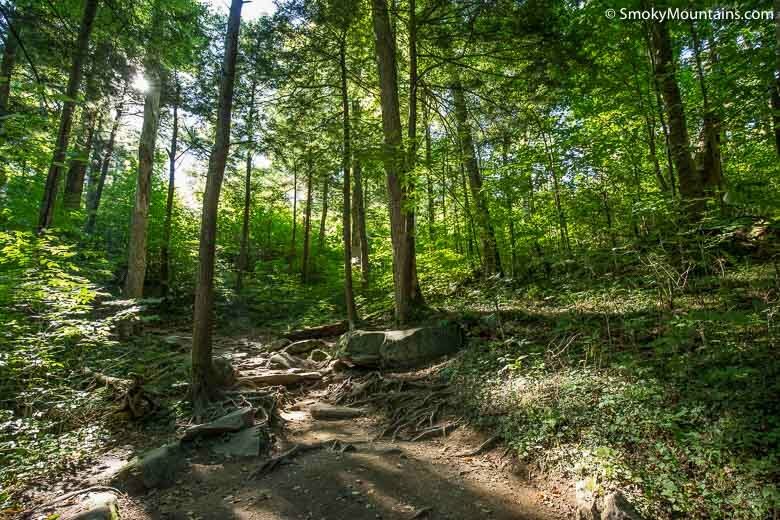 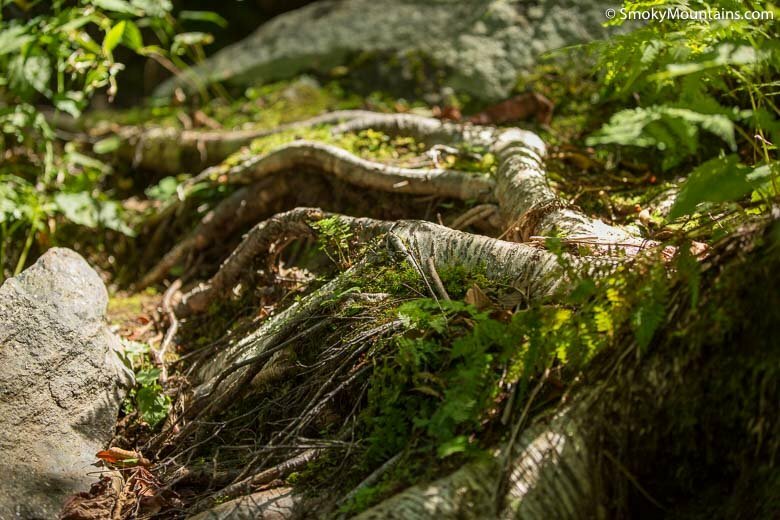 From ancient trees and the underside of Grotto Falls to the big views from the summit heath bald, Brushy Mountain via the Trillium Gap Trail serves up quite the variety of scenery. 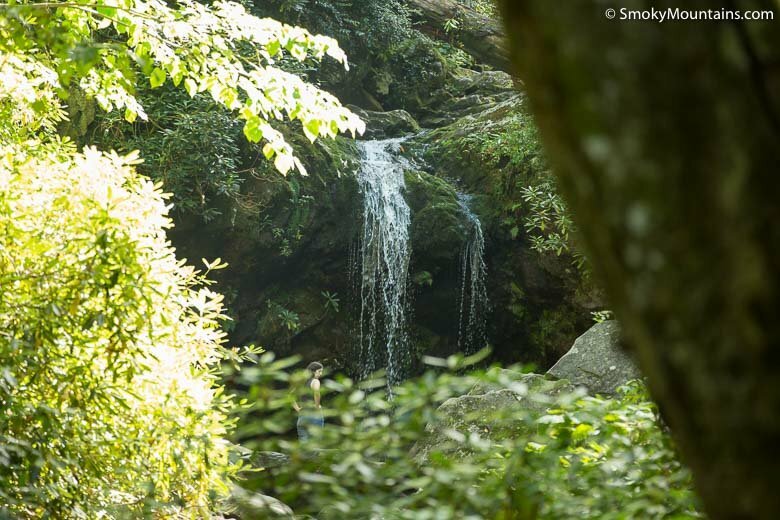 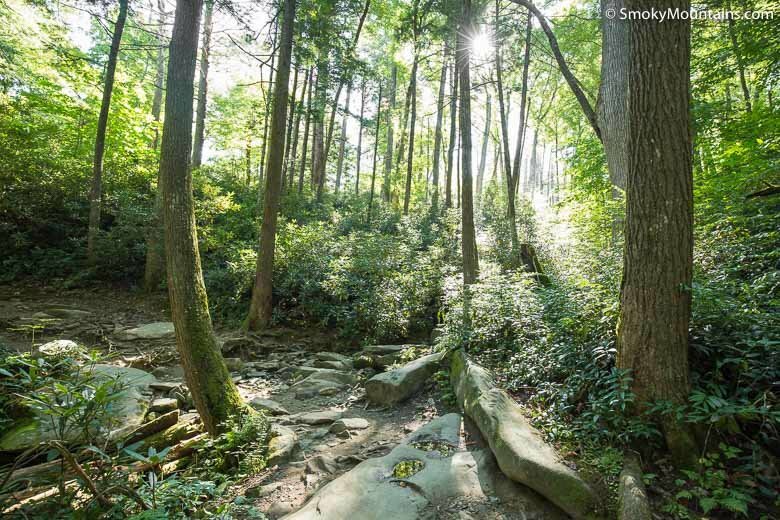 Old-growth groves, a bewitching waterfall, and a heck of a panoramic view: These are some of the highlights of the Brushy Mountain Trail via Trillium Gap. 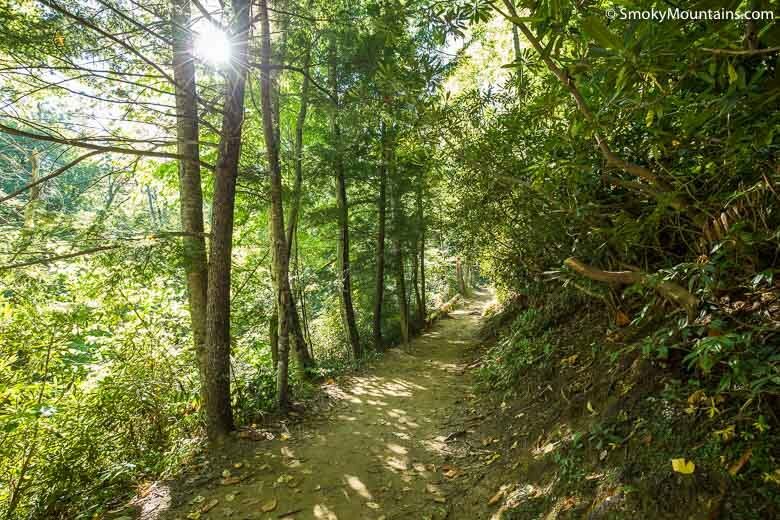 With 6.8 miles round-trip and over 1,700 feet of total elevation gain, the route’s moderately challenging—but well worth the effort! 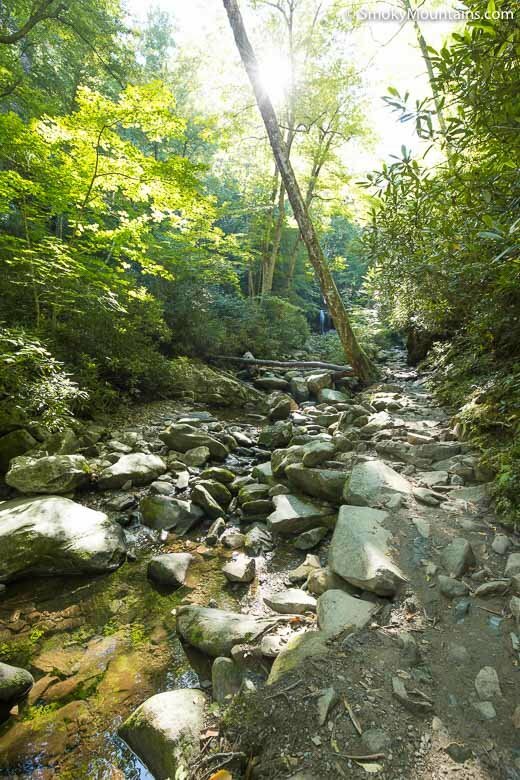 The first leg of this trail, which ascends to Grotto Falls on Roaring Fork Creek, is a popular hike because of the waterfall payoff. 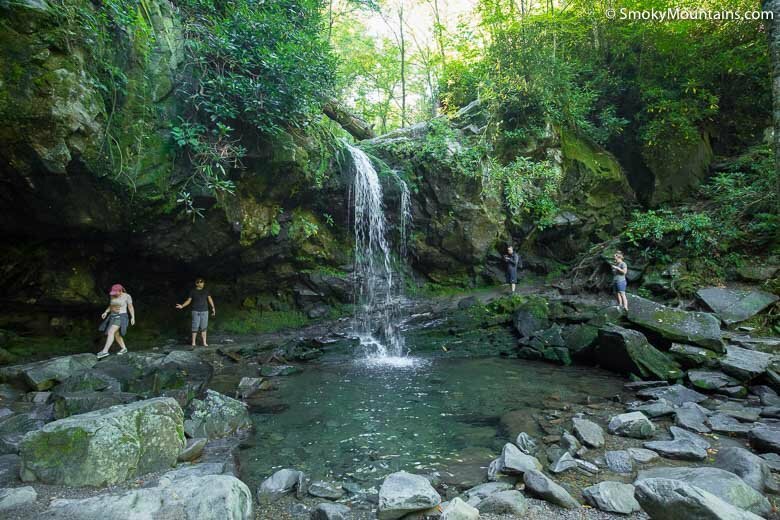 The misty alcove of the 25-foot plunge is definitely one of the scenic pinnacles of Great Smoky Mountains National Park. 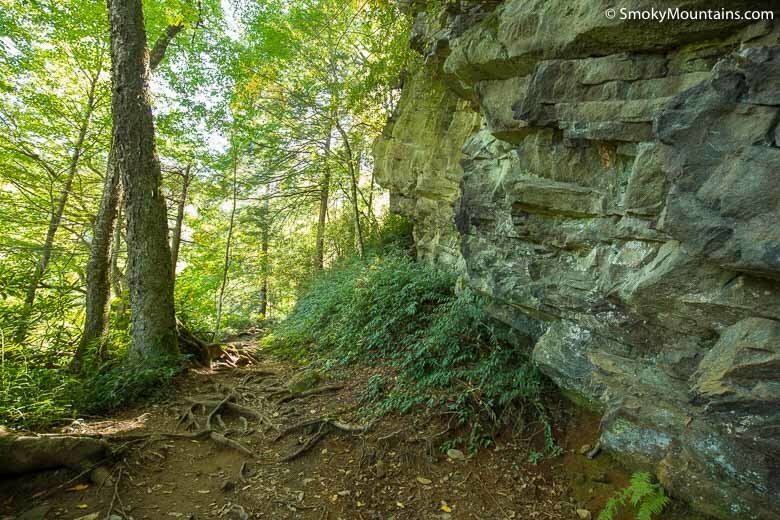 Even before you reach it, however—a bit more than a mile from the trailhead—you’ve got some remarkable natural spectacle at hand. 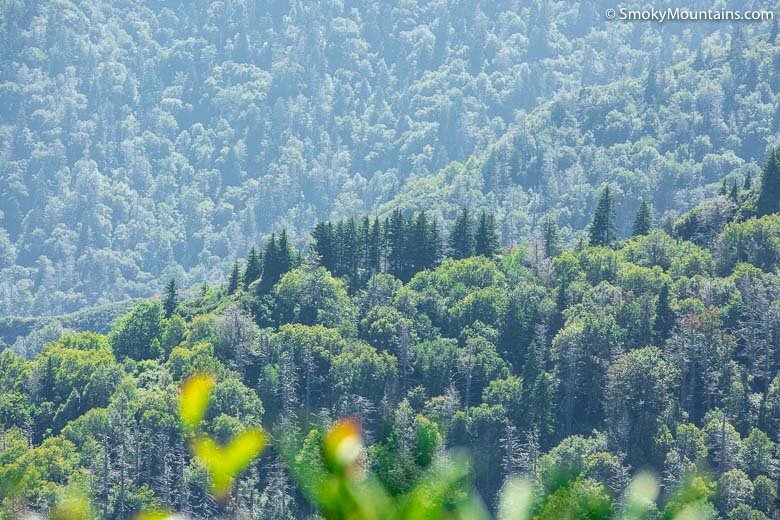 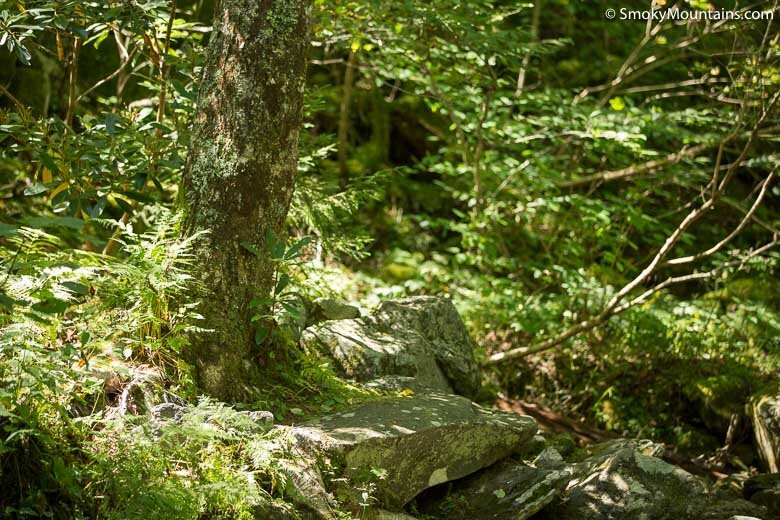 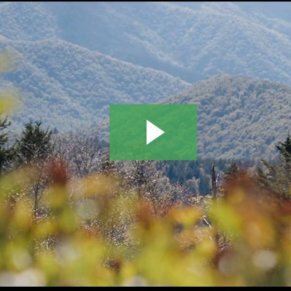 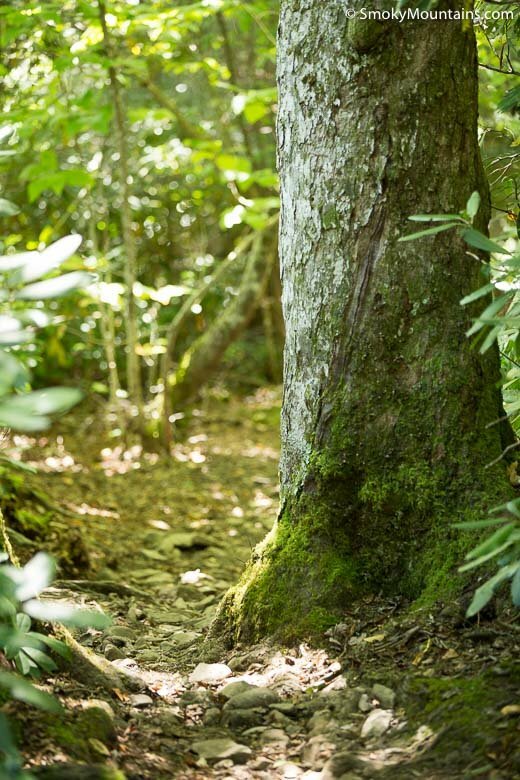 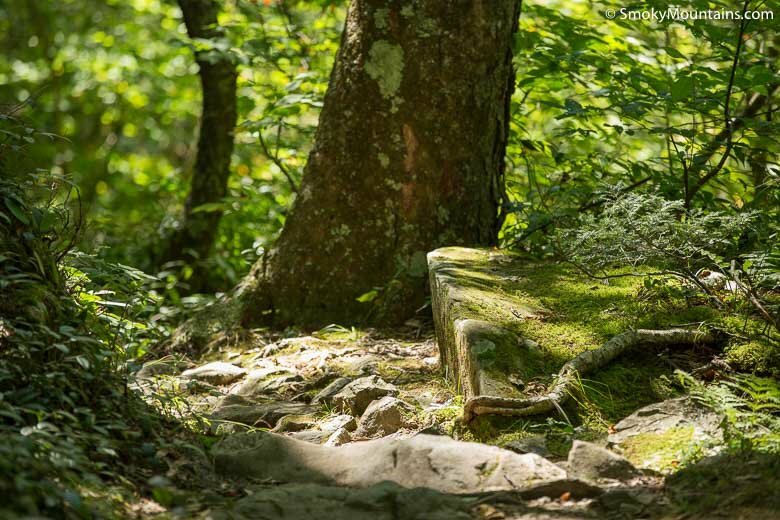 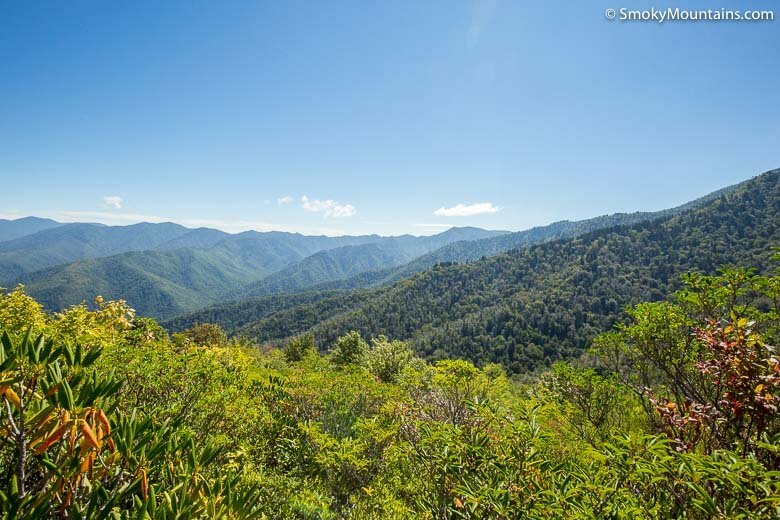 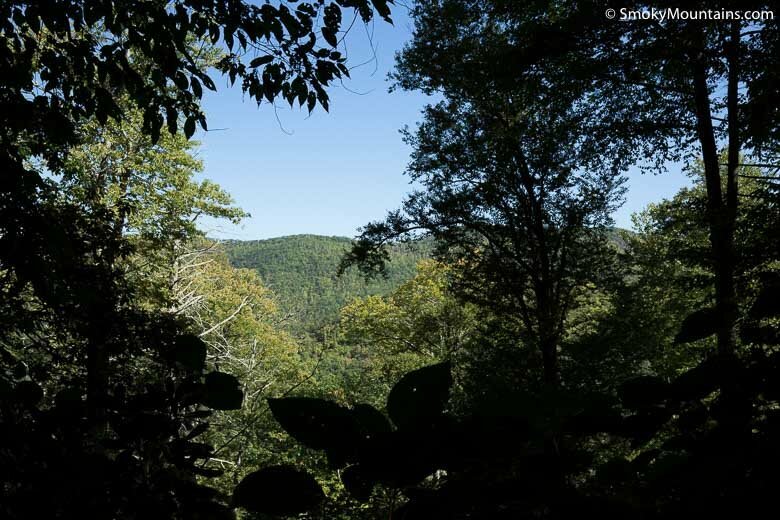 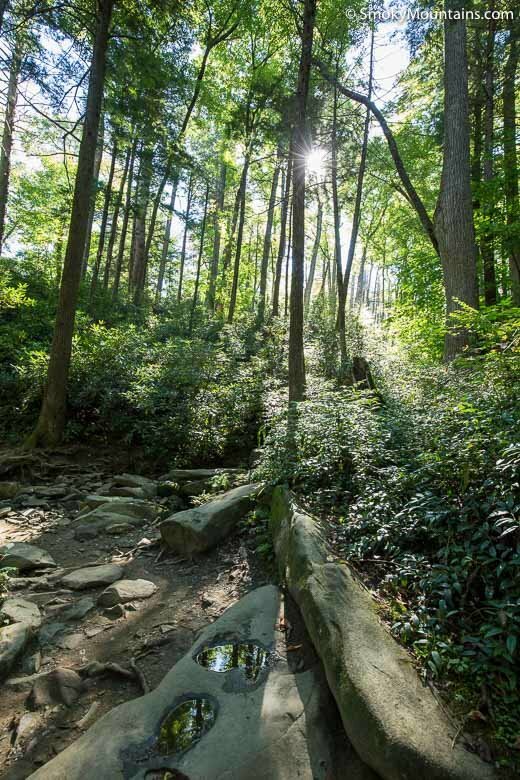 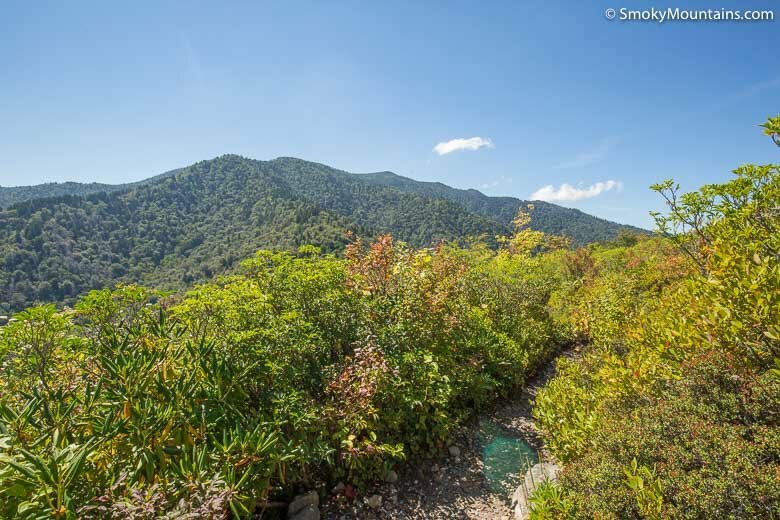 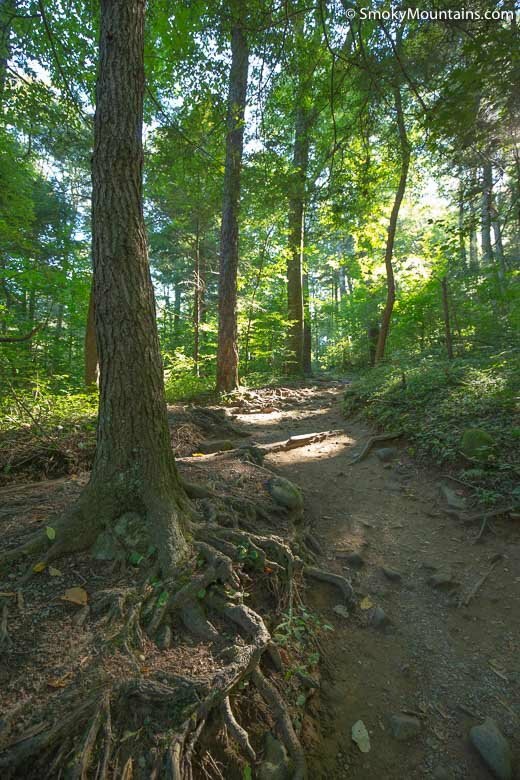 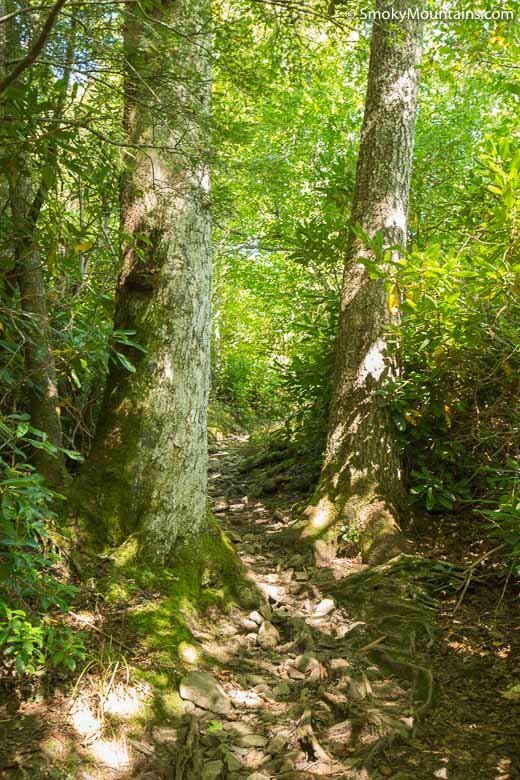 You’ll be tramping through old-growth cove-hardwood forest: a beautiful example of the significant acreage of virgin woods protected in the Great Smokies. 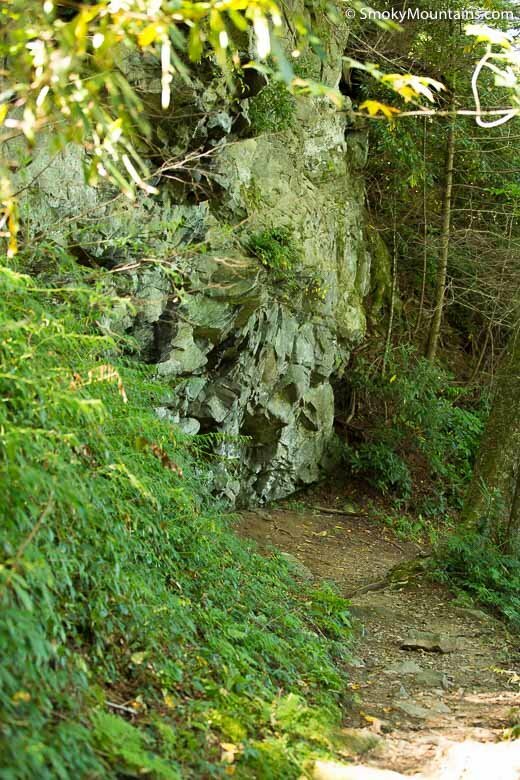 Keep an eye peeled for huge old eastern hemlocks, among the most impressive conifers in the range. 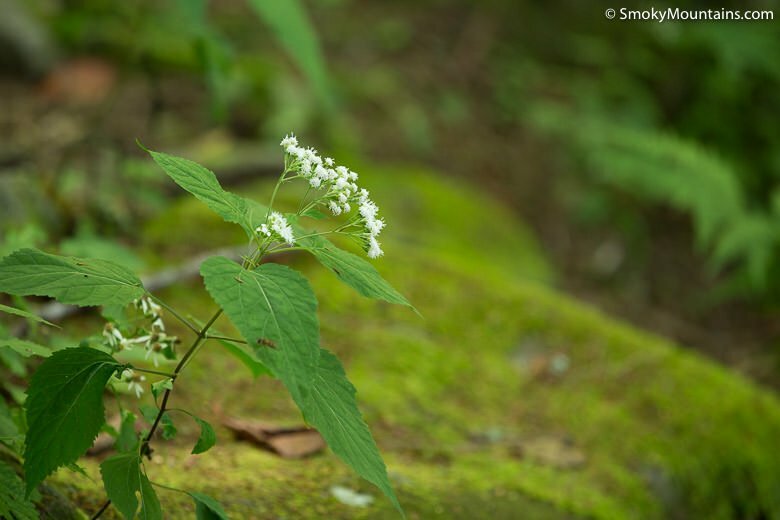 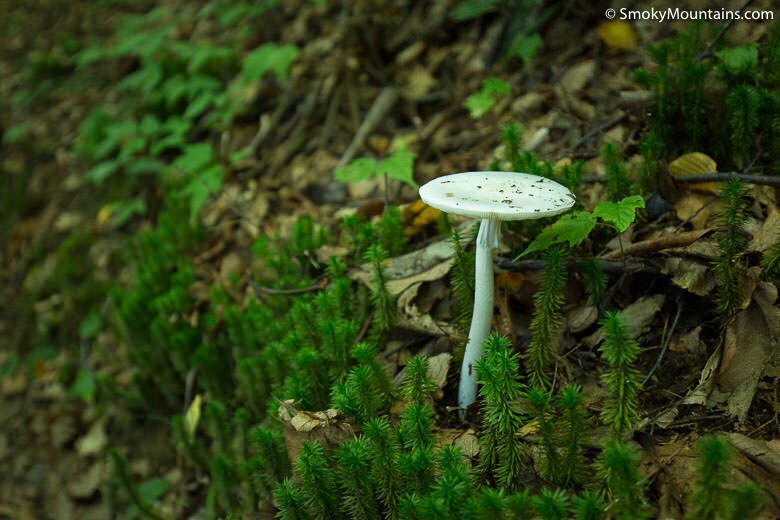 Spring through summer, forest wildflowers—trillium, Dutchman’s breeches, and others—brighten the ground cover. 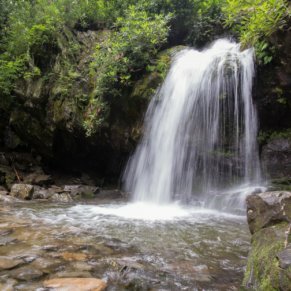 In a bit more than a mile, you’ll reach Grotto Falls, feeding a plunge pool in an almost jungle-like setting. 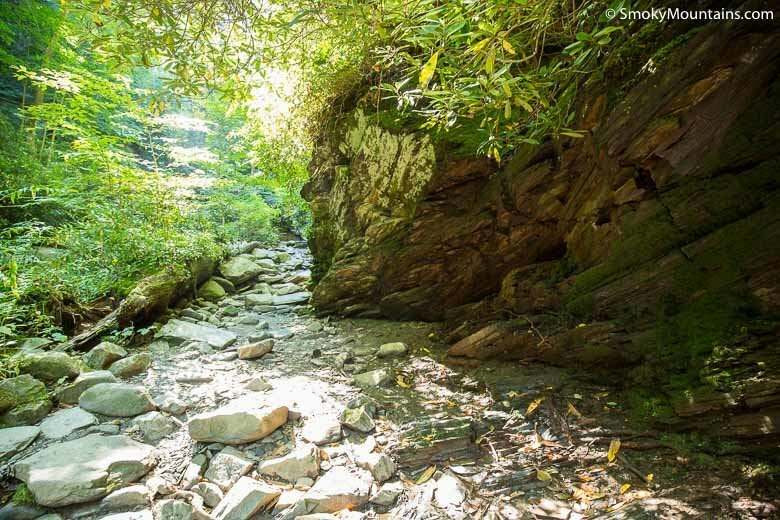 The trail actually leads behind the chute of water, serving up an unforgettable perspective. 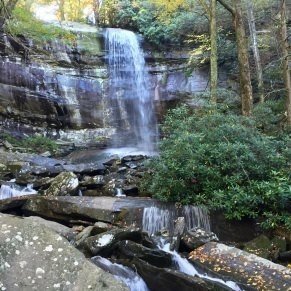 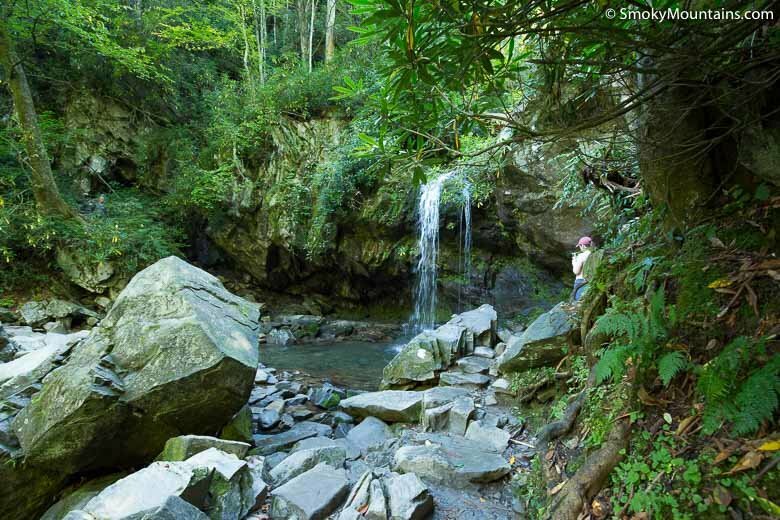 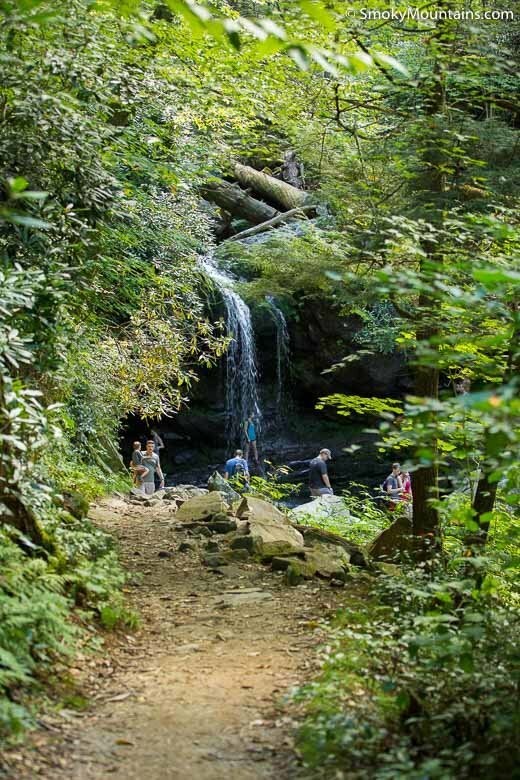 You’ll lose the crowds past Grotto Falls, ascending to Trillium Gap: a wooded pass on the southern flanks of Brushy Mountain, reached some three miles from the trailhead. 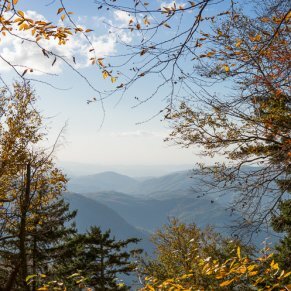 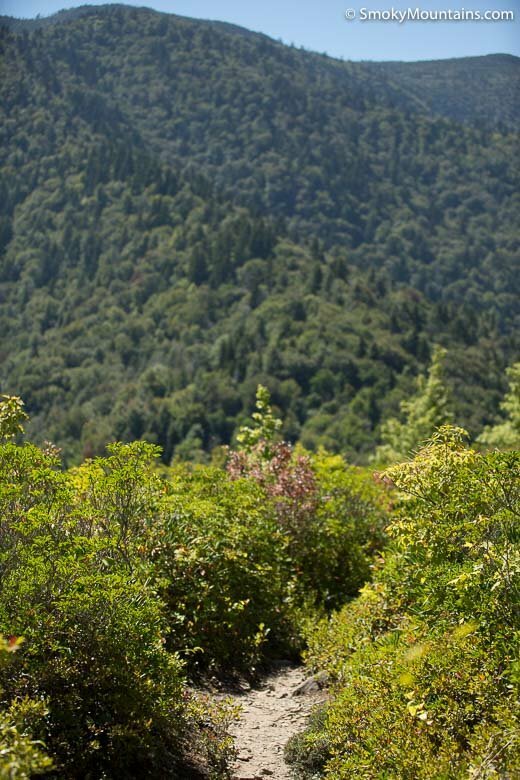 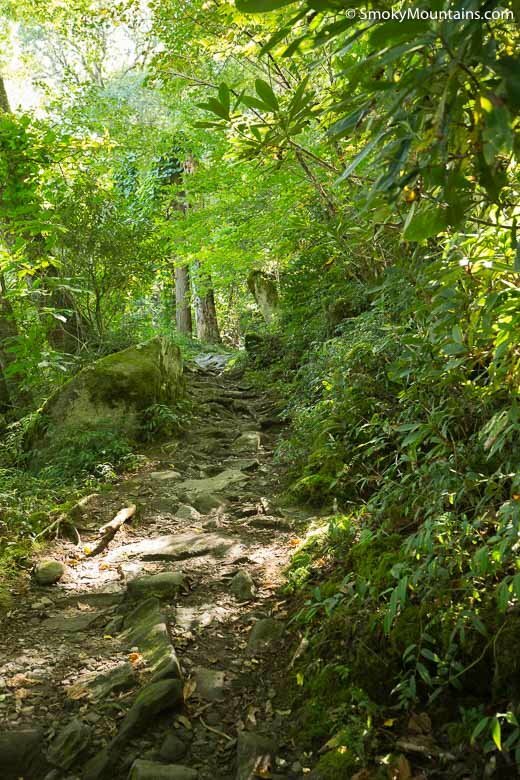 Here you’ll find a trail intersection: the Trillium Gap Trail to Mount Le Conte forking to the south, the Brushy Mountain Trail from Porters Flat coming in from the east, and the path up to the top of Brushy Mountain—the one you want—ascending to the north. 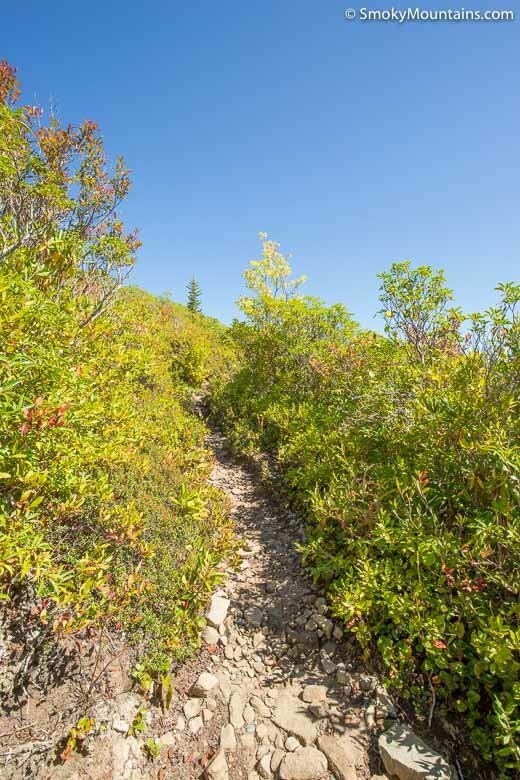 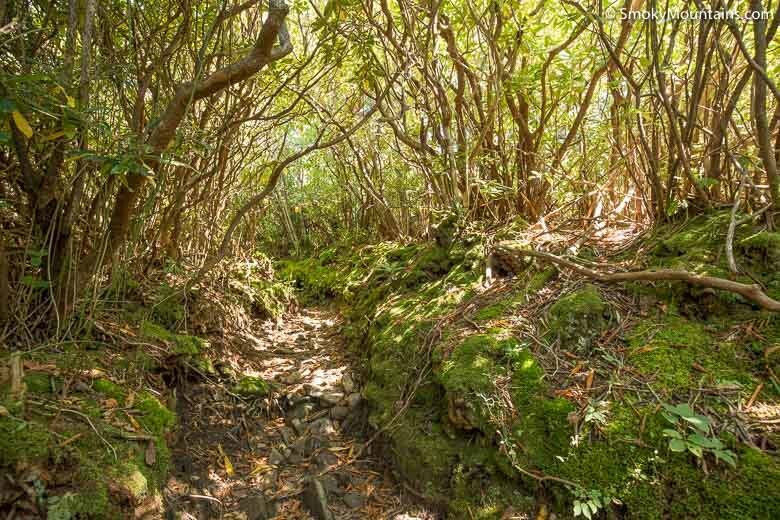 It’s only another quarter-mile through dense rhododendron and mountain-laurel thickets to the summit, which gets its name from these shrublands. 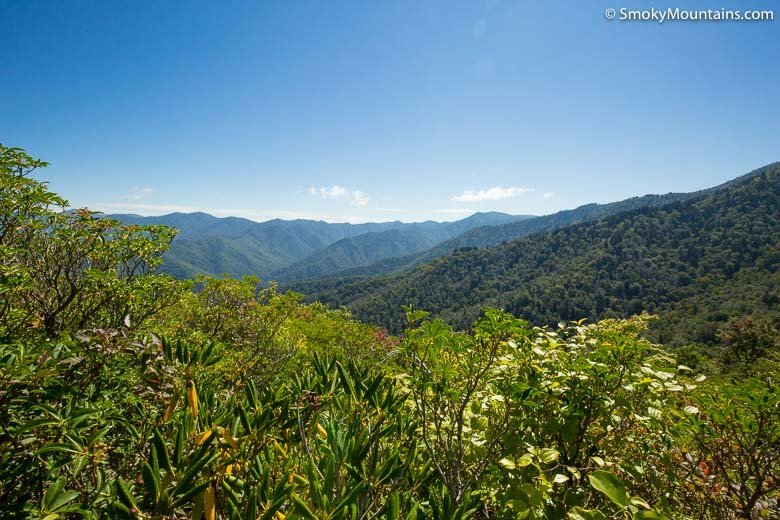 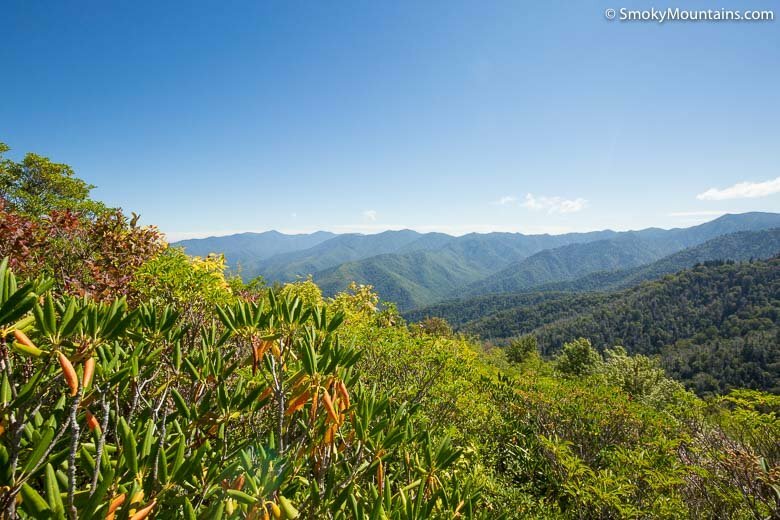 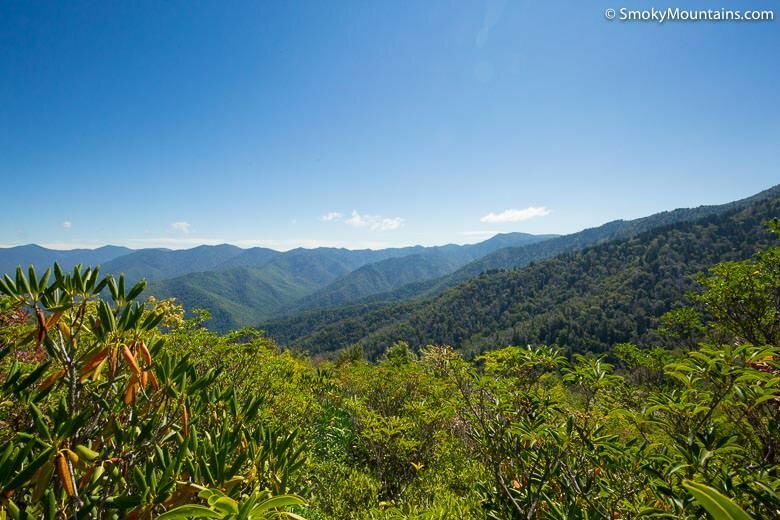 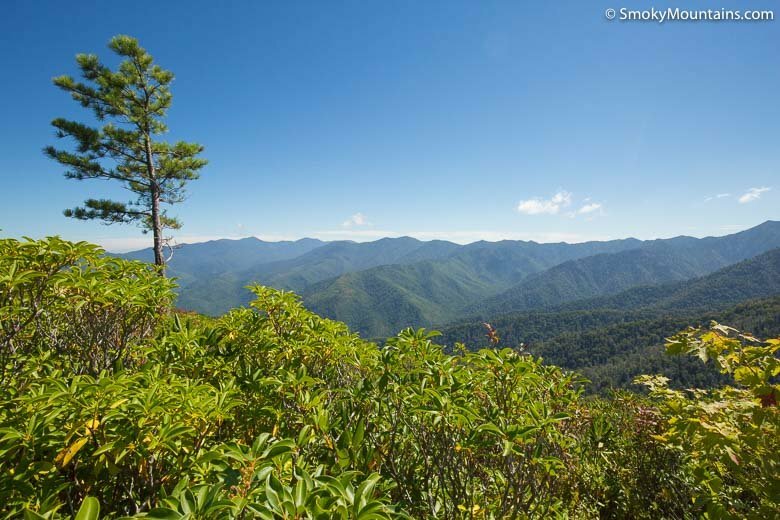 In the Southern Appalachians, the shrubby crown of Brushy Mountain is called a “heath bald.” The summit view is fantastic: Mount Winnesoka and Mount Le Conte close at hand, plus Mount Guyot, the Sawteeth, Charles Bunion, Greenbrier Pinnacle, and other landmarks of the eastern Smoky Mountains. 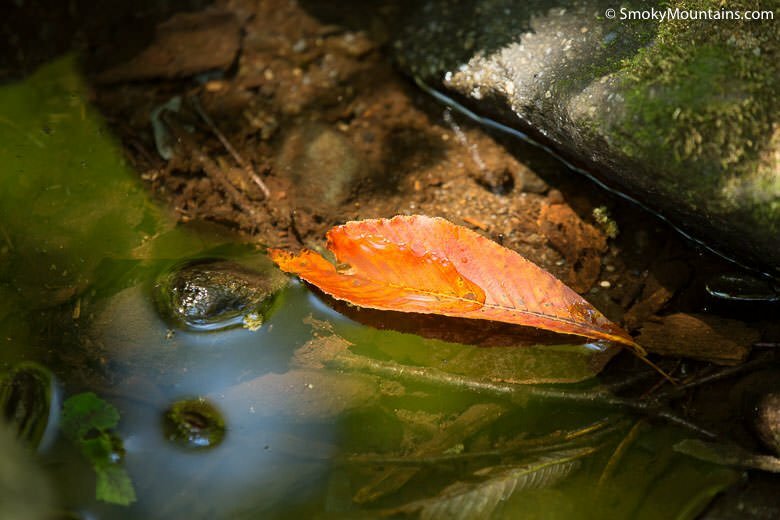 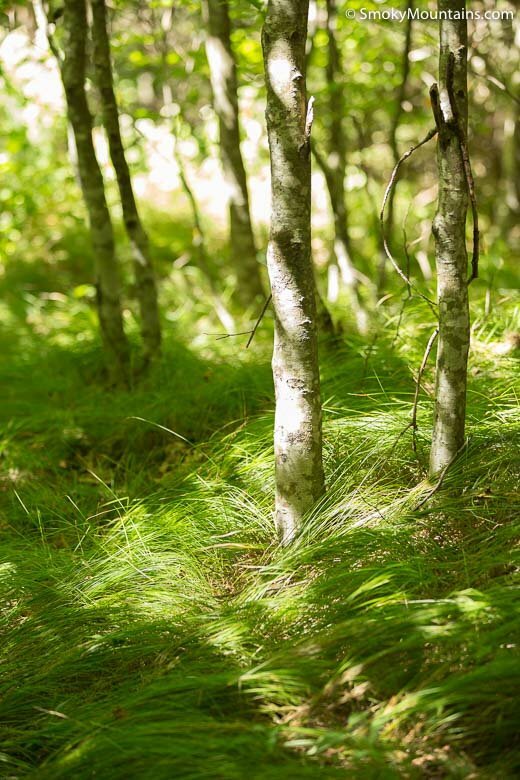 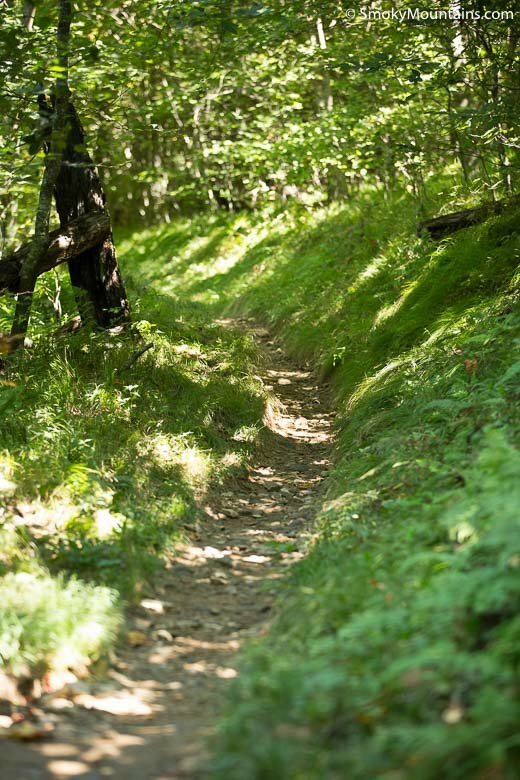 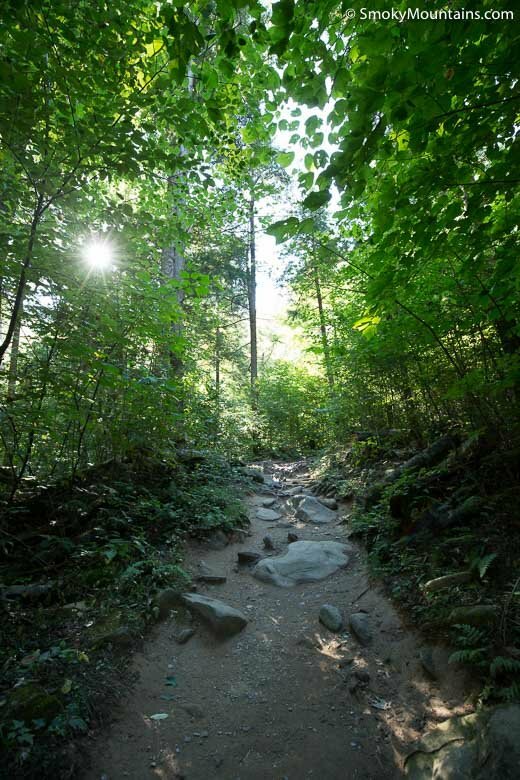 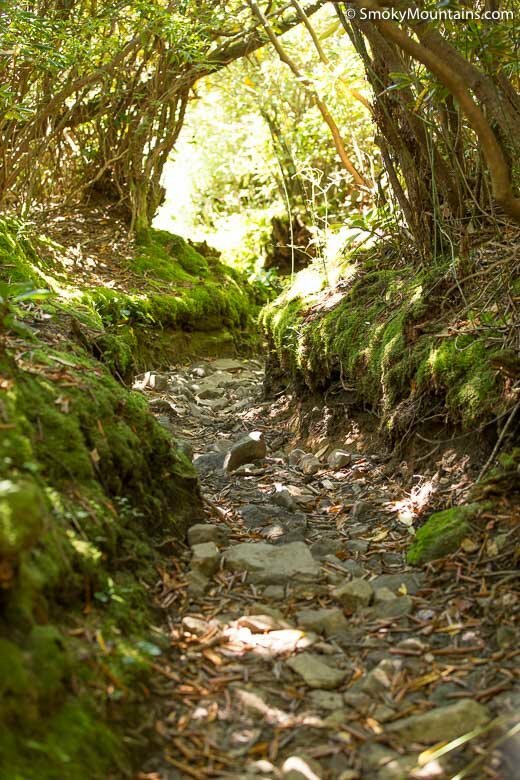 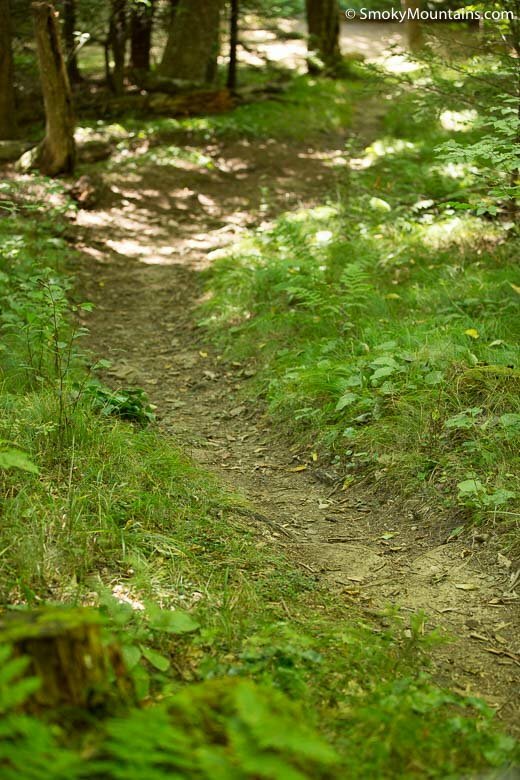 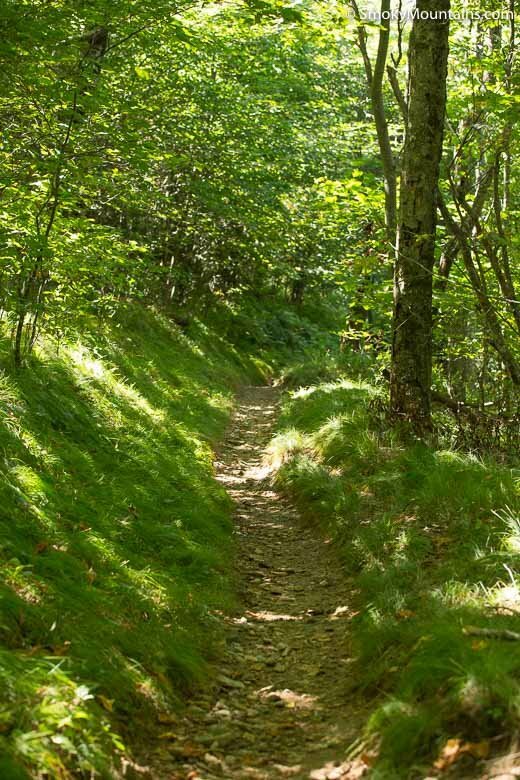 -The Roaring Fork Motor Nature Trail is typically open from spring through late fall. 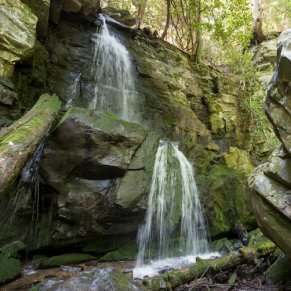 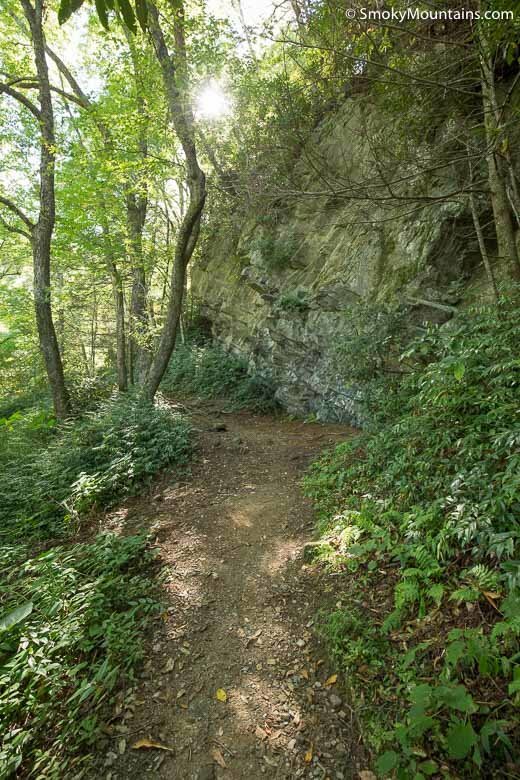 During the winter, you can reach Brushy Mountain from Cherokee Orchard Road via the Rainbow Falls Trail, or from the east via the Porters Creek Trail out of Greenbrier. 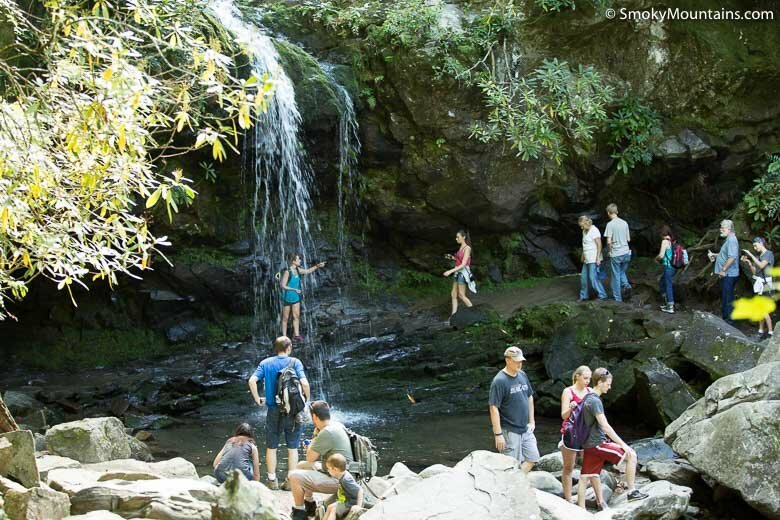 -Watch your step around Grotto Falls and throughout the gorge of the Roaring Fork: Going can be slippery. 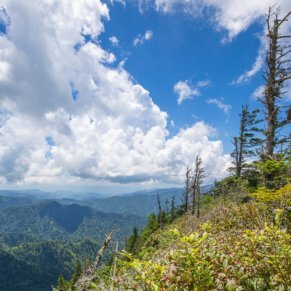 -View-wise, be sure to especially key into Mount Le Conte and Mount Guyot: at 6,593 feet and 6,621 feet respectively, the third- and second-tallest mountains in the Great Smokies. 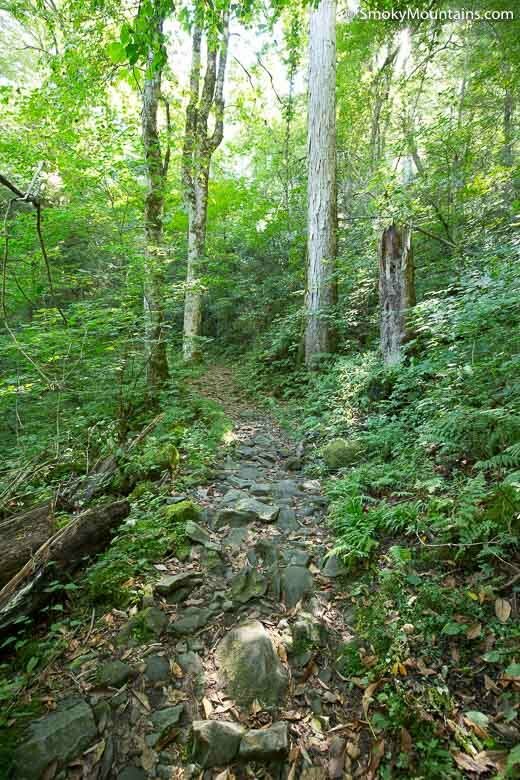 Traffic lights in Gatlinburg are numbered, so if you are visiting the trail from the city, begin at traffic light number 8. 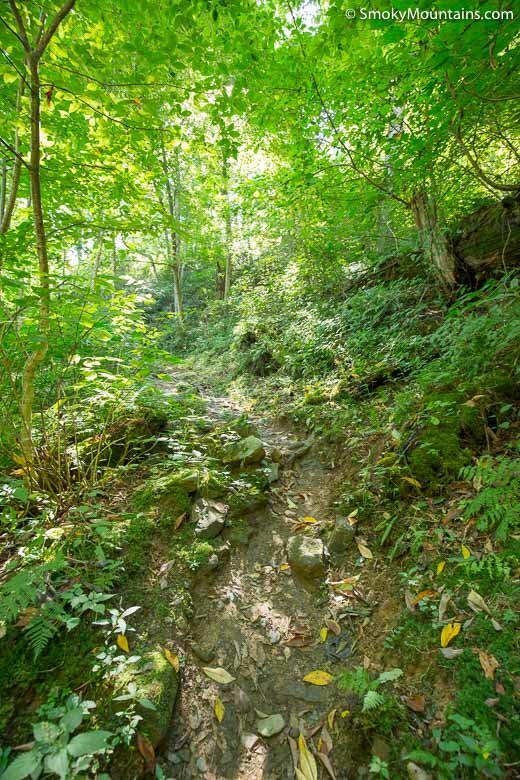 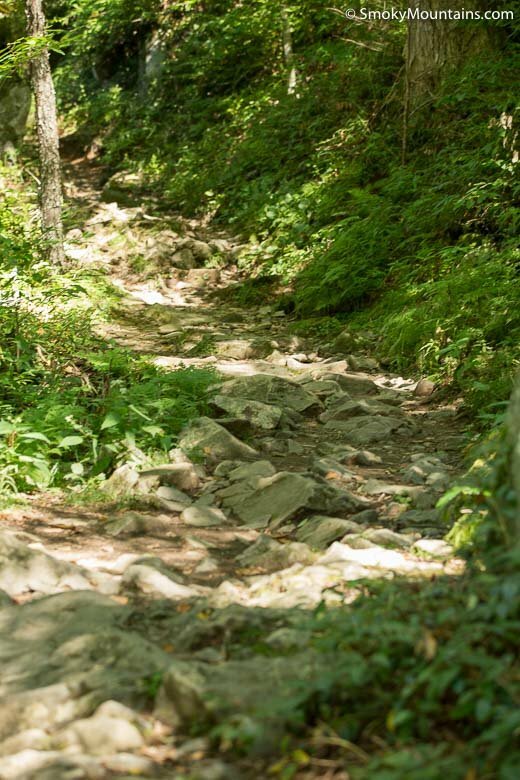 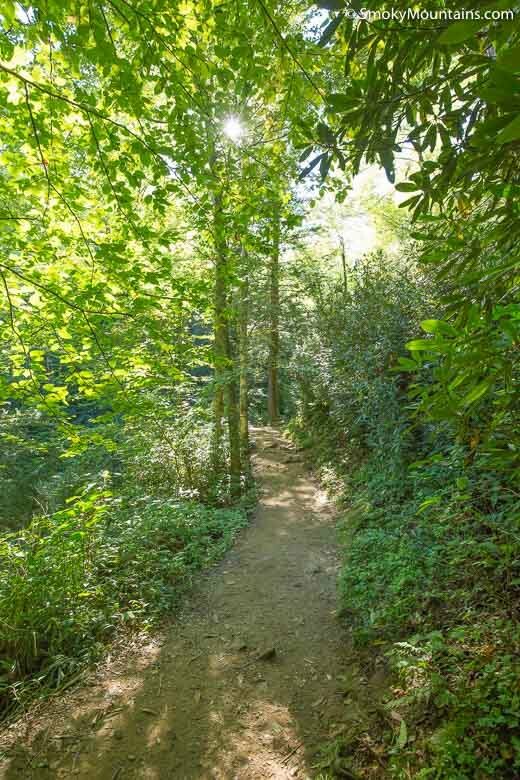 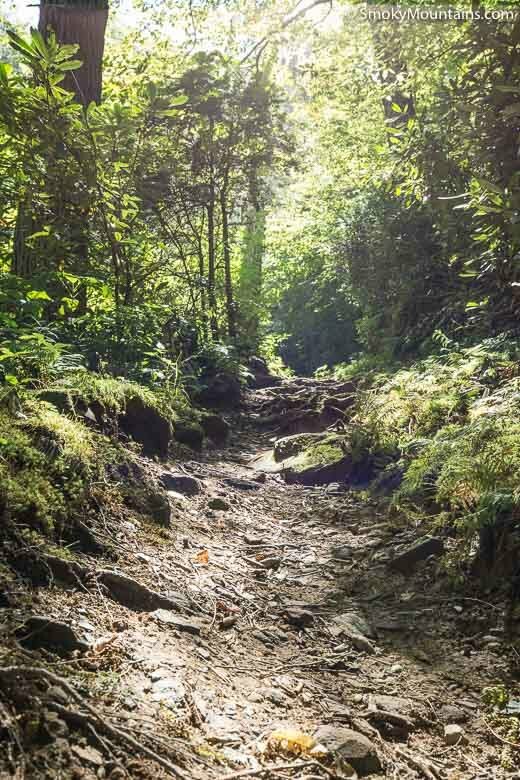 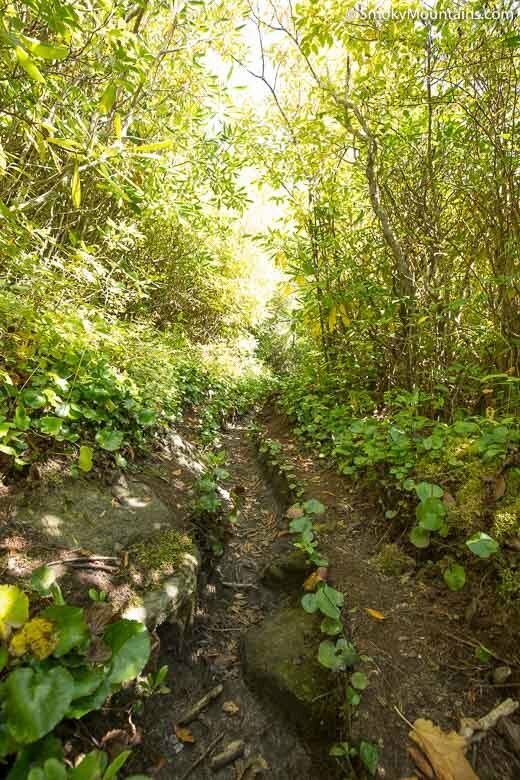 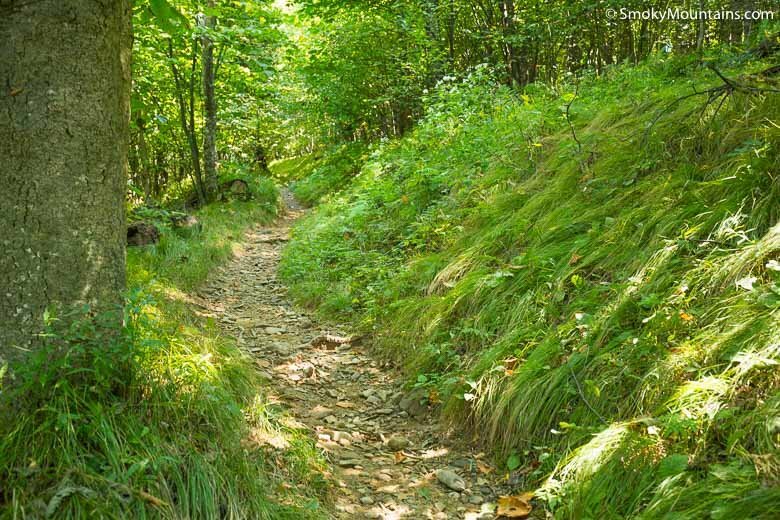 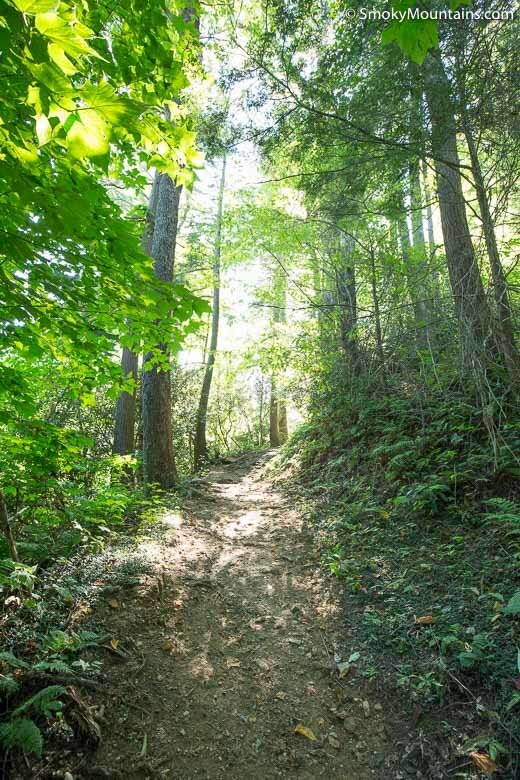 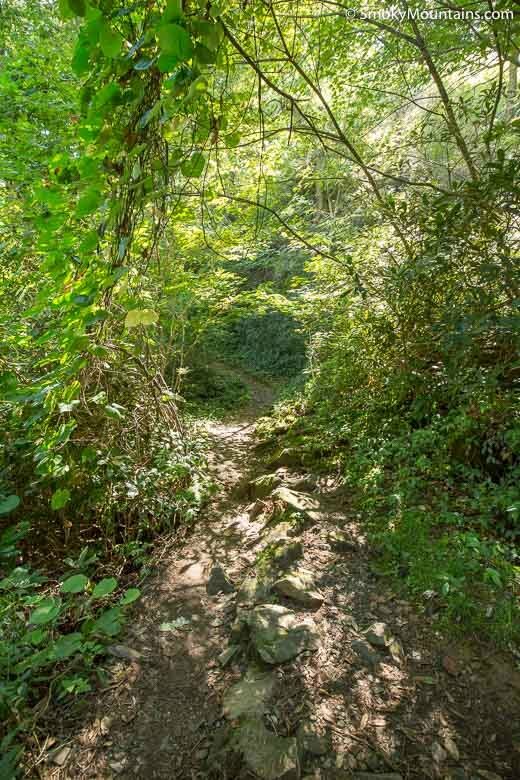 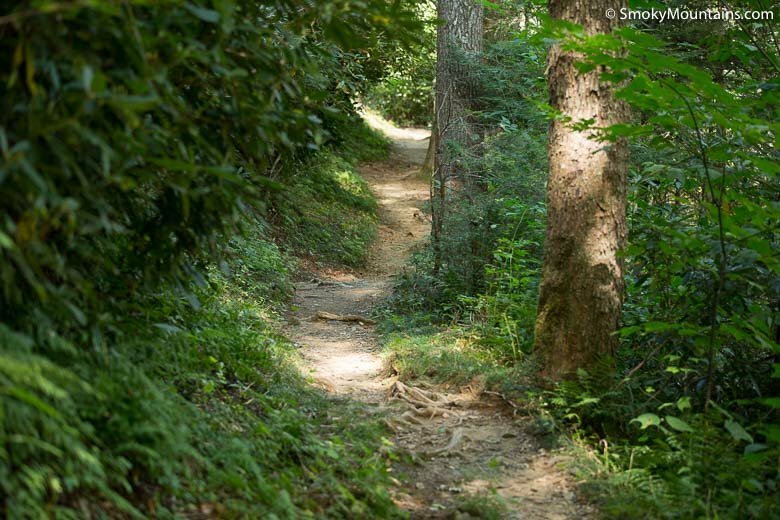 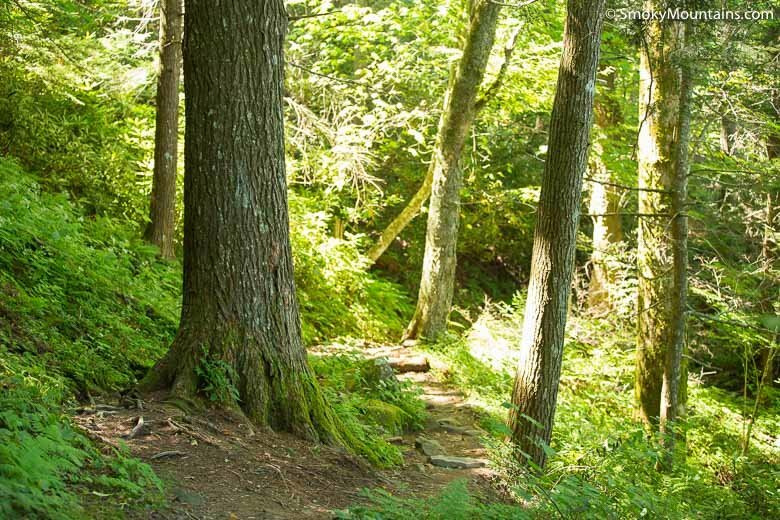 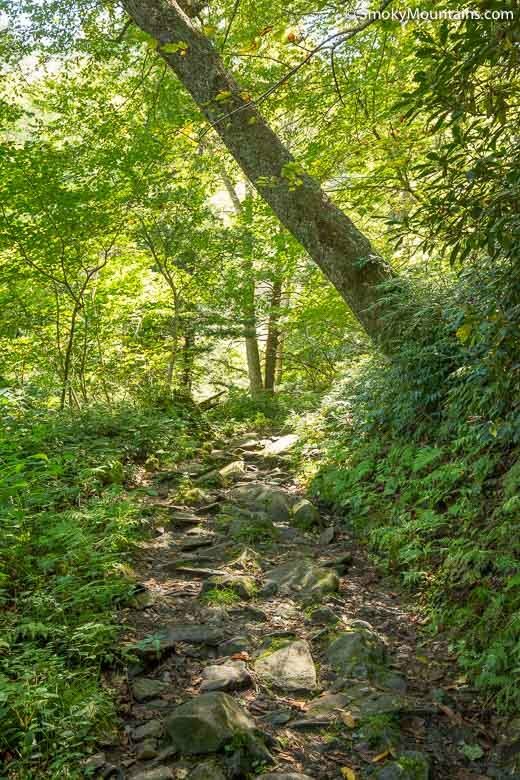 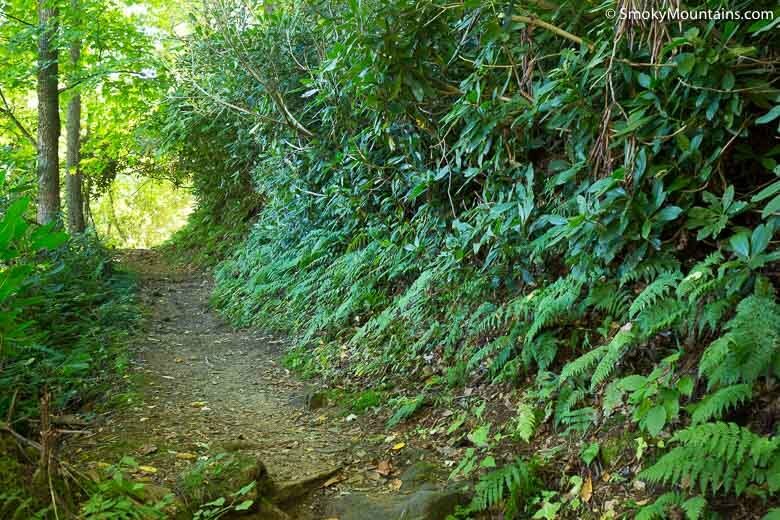 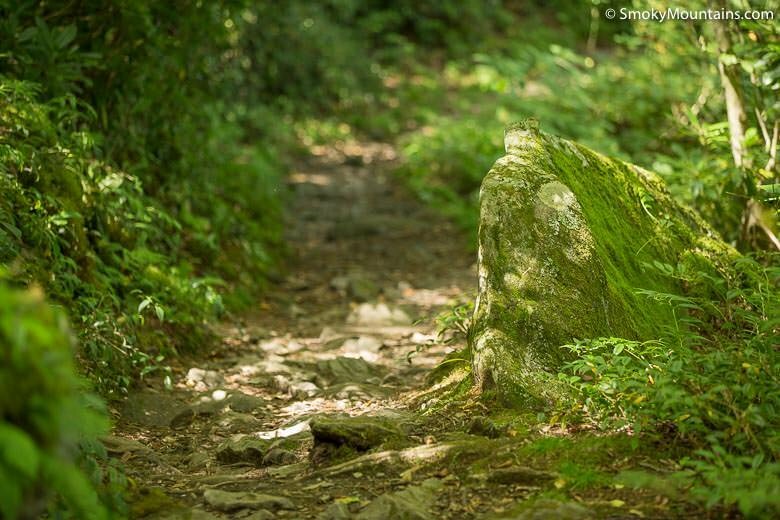 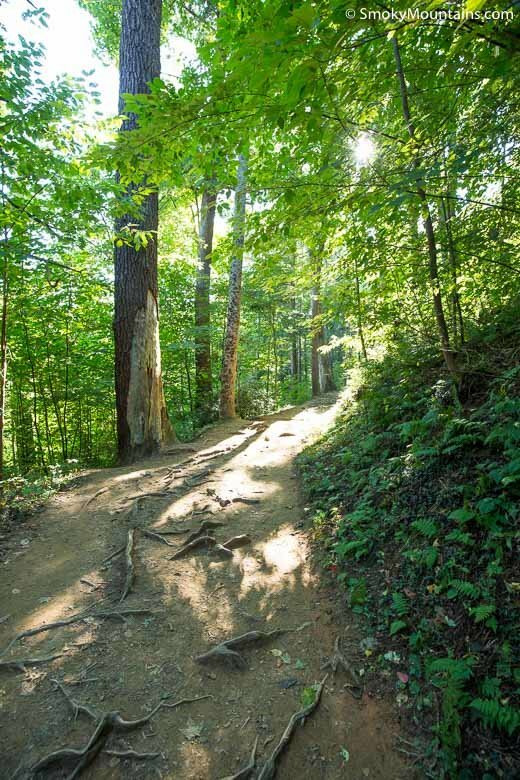 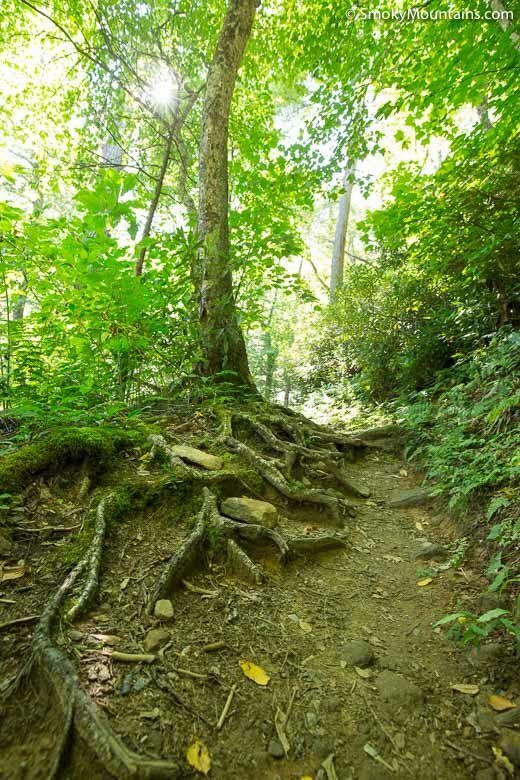 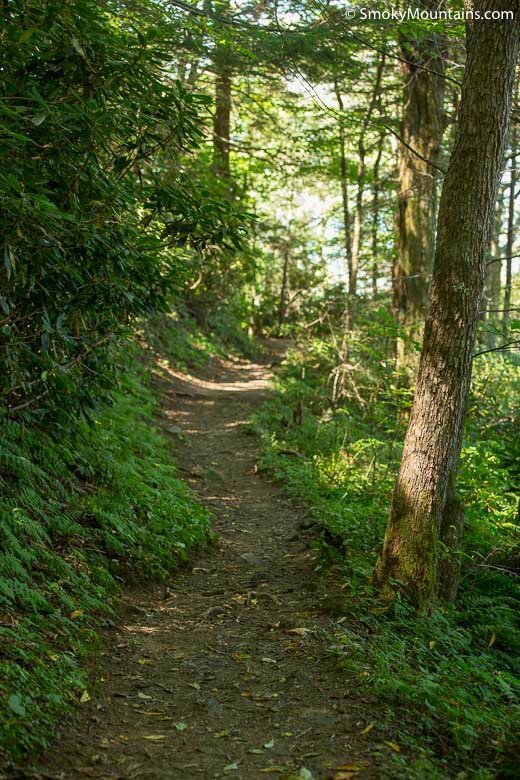 Turn onto Historic Natural Trail and follow it several miles until you reach Cherokee Orchard Loop Road inside Great Smoky Mountain National Park. 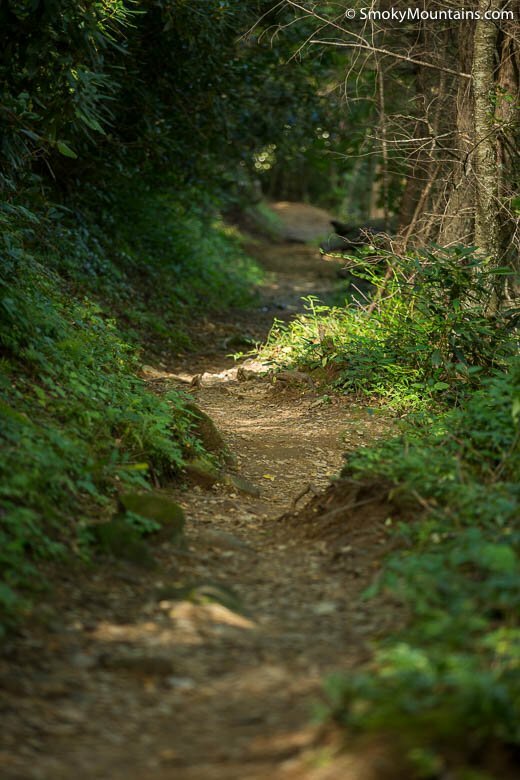 Follow the loop nearly a mile before turning right onto Roaring Fork Motor Nature Trail. 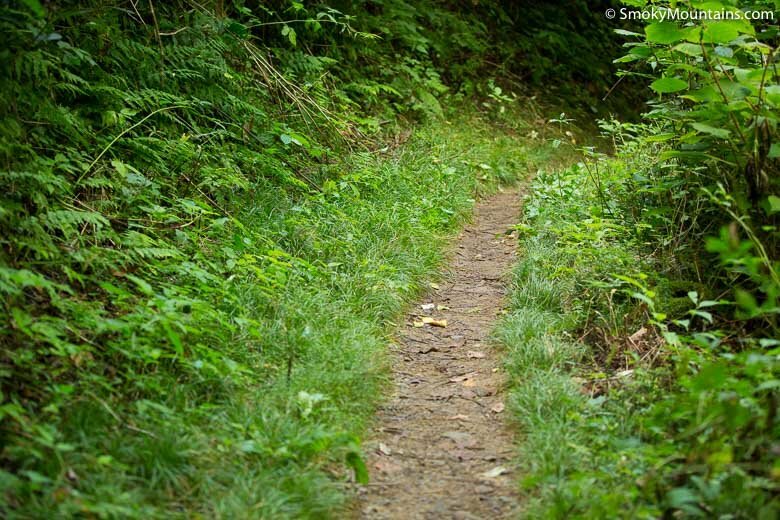 Like the loop, this is a one-way road. 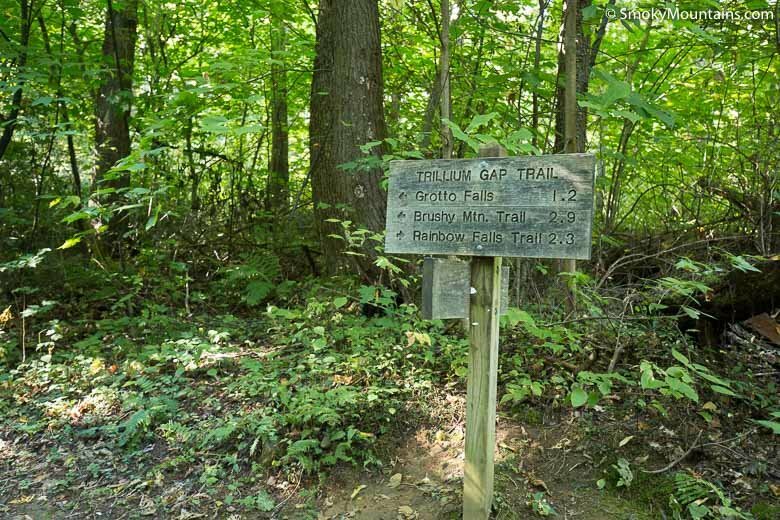 The Trillium Gap Trail parking area will be on your left approximately a mile and a half down the road. 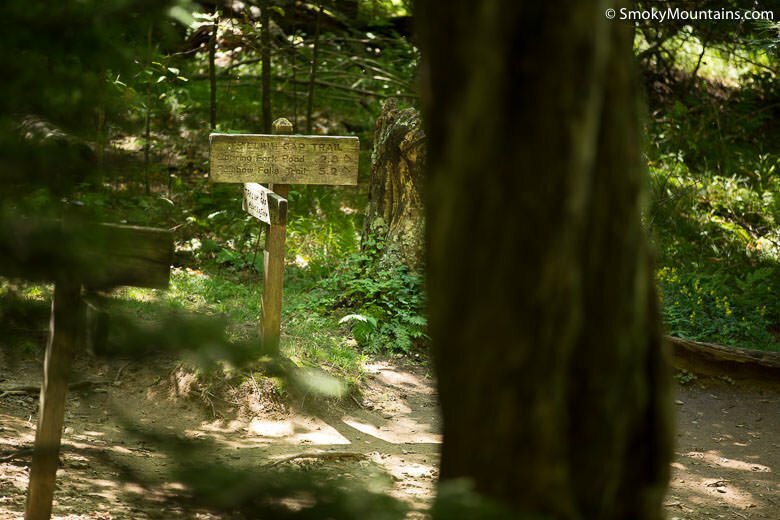 We recommend arriving early for a parking space, as they fill up quickly. 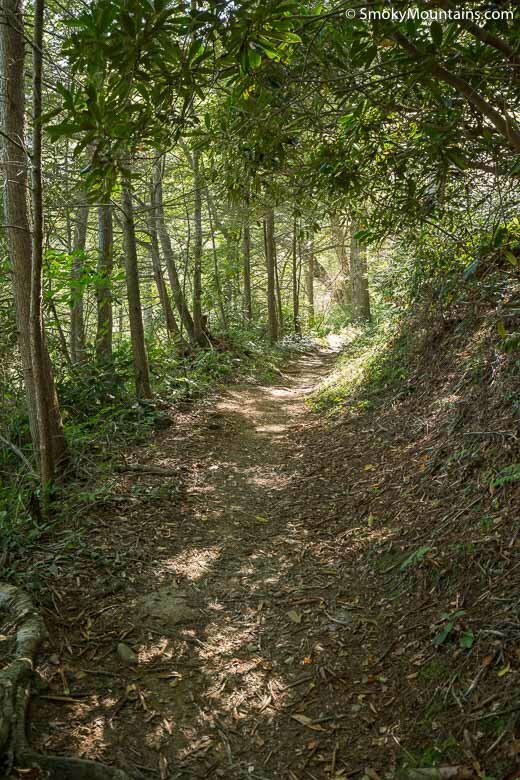 Don’t fret if you find a full lot, though; additional parking is available further up the road — you’ll just need to do a little walking to reach the trailhead.